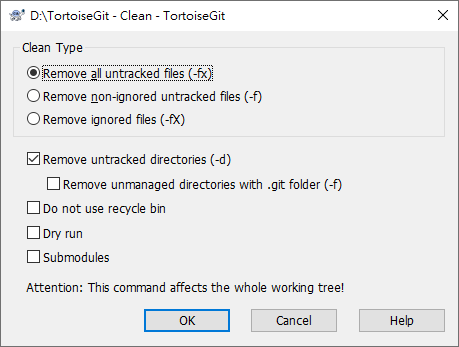 In order to remove untracked or ignored files from the working tree use TortoiseGit → Cleanup. Then a dialog comes up which allows you to clean up the working tree by recursively removing files that are not under version control or ignored, starting from the current directory or on the whole working tree (depends on version of installed git). Clean all untracked files This removes all untracked files, including those ignored by Git. This is the cleanest option. Clean only non-ignore untracked files This removes untracked files, but excluding those ignored by Git. Clean only ignored files This removes only files ignored by Git. Remove untracked directories This removes untracked directories too. Do not use recycle bin Use this option if you want to delete those files directly and permanently. Make sure you do not regret! Dry run This just gives the list of files to be deleted, but it does not perform any deletion. Submodules This also cleans submodules recursively. You can find more information at the section called “git-clean(1)”.